In the meantime, I'll be perusing the pages I have completed, like this one of my girl at her spring dance recital. It's bright, colorful and full of energy - just like her! I don't usually use photos larger than 4x6, but I loved this one so much I printed it larger (5x7) to use on this single-photo page. I surrounded the photo with flowers cut from white cardstock and filled the petals with various patterned papers in a single color palette. The papers are from the BasicGrey collection, Fresh Cut, and it's one I'm hoarding every last scrap of! The title & journaling block are tucked into the space below the photo. To get the journaling block to flow around the title, I imported the electronic cut file for the word "bright" into my word processing program and then set up the text around it. I deleted the cut file before printing the journaling onto the kraft cardstock. Have a great weekend and enjoy these last few weeks of summer, friends! When I first learned about the visual triangle in design (Debbie Hodge does a great job of explaining it here!) I'm not sure I fully appreciated the impact it could bring to a scrapbook page. It wasn't until I actually started implementing it into my designs that I realized its capacity for framing the page, guiding the viewer's eye to key elements, and creating a sense of balance and organization. Nowadays, it's rare that I create a page without a triangle of some variety, and on some layouts - like today's featured page - I rely almost solely on the visual triangle for the bulk of the design! I surrounded my 5x7 photo with flower circle die-cuts in small, medium and large. I filled the circles with patterned paper and the flowers with vellum to softly separate them from the patterned circle. Behind each circle is a color-coordinated tag, and I layered various embellishments over the top, keeping each cluster to a single color scheme. The triangle formed by the three circles helps create a sight line through the elements of the page - your eyes naturally follow the progression from small to large. There are lots of little elements in each cluster (tags, chipboard, transparencies & punches) but because each group is color coordinated, it reads as one component. I love how the triangle frames my photo and keeps the focus on the shining smile of my sweet girl! If you'd like to download the cut files for these circles (an archive that contains .svg, .dxf and .png files); just click on the graphic above. They are great for creating a visual triangle, or can be used alone as page accents. Enjoy! The latest issue of SCT is hot off the presses, and I hope you all are enjoying the magazine! Hard copies are now available at many Barnes & Nobles (you can check this link to see if your local store has it! ), or you can download a digital version right here. The summer issue is full of so much inspiration that I pretty much dog-eared every page in my copy. 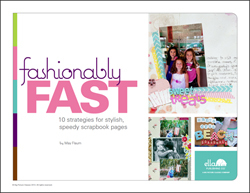 Lots of fabulous pages and ideas from a team I consider myself very luck to be a part of! My contribution to the issue included a pocket page spread that I'm using as a title page for our Mexico vacation album. I always take so many photos on our annual trip to the Mayan Riviera, and now they will finally have a whole album to call home! The spread mixes a 12x12 layout and a pocket page, and it's a combo I'm really loving these days. I never could quite fall in love with Project Life-style scrapping because I felt too confined with the smaller, defined spaces. But mixing it with traditional layouts has become a recipe that works with my style and I'm using it more and more. I love that I can go big and bold on my 12x12 layouts, and balance it with smaller but coordinating elements on the pocket half. 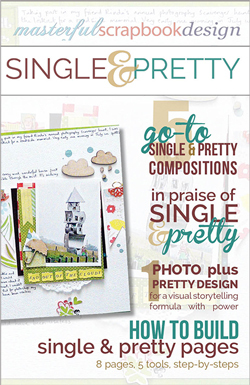 The pocket side includes a die-cut that I designed as my title block (and it's a free download at the SCT site!) To draw extra attention to that portion of the page, I filled the pocket with various sequins and then stitched the top edge closed to keep them in. It's a fun interactive element of the page that you couldn't implement on a standard 12x12 page! I also really dig that the pocket side of the spread can contain my journaling. It allows me to create the layout side without worrying about where to put the story - a step that usually hangs up my design process. There's always a perfect pocket size (or two) to fit my words, and I think it allows more flexibility than a 12x12 layout to write as little or as much as you want to. Yesterday we awoke to more than 12 inches of snow and the all-hallowed snow day notification from the schools. Gotta love an unexpected mini-vacay in the middle of the week! In celebration of that, I thought I share a snowy page (and a free cut file to go along with it! I snapped these shots of Hayden testing out his saucer off the mountain of snow that had been plowed from the driveway all winter. What the photos don't show is the road at the bottom of the snow hill, making it necessary to bail off said saucer at the end of the run, lest you careen into the path of oncoming vehicles. Snow days are never boring around here, that's for sure! To balance out the stack of photos on the left side, I cut an argyle pattern from white cardstock and filled it with a few diamond shapes cut from BasicGrey Aurora papers. I also added some diagonal lines of machine stitching to secure everything to the background. Atop the cut file, I layered chipboard, acrylic and cardstock shapes that tied to the theme of the page. I printed my journaling on white cardstock and cut it into strips, staggering them amongst the shapes to help lead the eye through the design. I love how well the Aurora line works for snowy day photos (something I tend to have a lot of here in Colorado!). I also love these type of "framing" cut files because they make it easy to add lots of patterns in an organized, contained space. If you'd like to download the cut file for your own personal use, just click the image below. Wishing everyone a warm and cozy Wednesday, snow day or not! Welcome to my little holiday celebration, the Twelve Days of Christmas! For the next twelve days, I'll be sharing holiday and seasonal layouts, with a few freebies and giveaways thrown in for good measure. I hope you'll pop in and help me celebrate the season as we count down to Christmas day! I'm kicking things off in a big, bold way with one of my favorite layouts featuring (what else?) a big, bold title! I love that this titlework perfectly sums up the feeling of the season! Underneath it, I layered up circles of patterned paper, tags, and various embellishments in two rows. The largest base circles are 2.125" and they get smaller from there. This is a great way to include lots of different patterns and elements on a page, because the layered circles keep everything organized and neat! I typed my journaling on a tabbed card and slid it behind my two photos, which are adhered at the edges with foam adhesive. This creates a neat little pocket that holds the journal card and keeps it safely tucked away! If you'd like to recreate this title, you can download a free cut file to create this title by clicking on the image below. The zipped archive contains svg, dxf, and png files that you can use with most electronic cutter software. Enjoy! And with that, I'm off to enjoy brunch and the Nutcracker! Happy Saturday! When I first started scrapping, pattern paper intimidated me. My early pages consisted largely of cardstock + minimal embellishments. I wanted to use pattern, but I wasn't sure how to incorporate it on a page while still maintaining focus on the photo and story. Fast forward several years, and I've gotten much more comfortable with patterned paper. In fact, there's rarely a page I create without it! I've learned many tricks to using it, but one of my favorites (and most-used) is to frame each pattern to "contain" it. 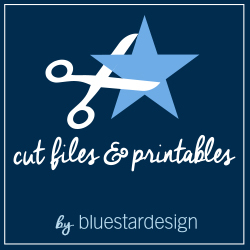 And grid cut files like the stars I used below are a perfect way to do that! Adding a white border around each pattern keeps them confined and separate, so they don't compete for attention. I used eight different patterned papers in this design, in four different colors. While there is definitely energy and motion (which helps support the whole theme of the page - running!) the end result isn't too chaotic because the patterns are organized within clearly defined spaces. To frame the focal point of the page, I grouped pairs of buttons in purple, dark pink and aqua in a triangle around my photos. To keep the embellishment clusters odd-numbers, I added silver star stickers, which also repeat the star theme of the die cut. You can download both the star grid and title by clicking the graphic below. The zipped archive includes both .svg and .dxf file formats. Wishing you a fantastic Friday, my friends! Tis the season for giving thanks! And as we begin counting down for my favorite holiday of the year (bring on the mashed potatoes!) I wanted to share a recent layout using BasicGrey's new line, Vivienne. Though it's got a definite girly vibe, the brown and orange infused into the designs make it perfect for autumn pages, too! I filled each letter in the bold title (which is available as a free cut file on the BasicGrey blog!) with a different patterned paper and then embellished the corners with chipboard shapes, epoxy flowers and a few lines of stitching. So go grab the freebie file! 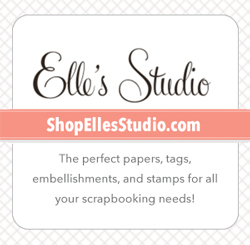 It can also be reduced in size for incorporating into Project Life and cardmaking. I'd love to see your projects using it, so please share! Hope you all have a super weekend! Fall is definitely in the air! Ok, who am I kidding? It's supposed to hit 90˚today! But regardless, I'm hanging up the autumn wreath and dragging out the pumpkin decor in preparation for my favorite time of year. And speaking of pumpkins, I've got a layout full of the fun gourds to share with you today! I had fun creating this colorful page with Bella Blvd's halloween line, Trick or Treat. I love the pops of aqua and green they added to this collection! The pumpkin grid was cut from white cardstock and then I added papers, stickers, washi tape and even feathers to the backside of the grid before mounting it on black cardstock. The feathers were a cool way to add texture to the page - I just had to to trim them to fit in the space (they are about 4" long!) For several of the pumpkins, I used washi tape in place of paper for the color. I embellished most of the cut-out areas with stickers as well. 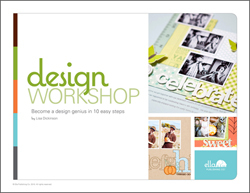 As a freebie today, I'm sharing the cut file I created and used on this layout. It's set up to fit on a 12x12 page, but you could resize it for smaller page formats or cards. The download includes dxf and svg file formats - just click here to grab it! 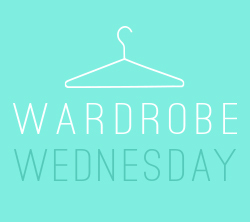 Hope your Friday is fabulous and don't forget to check out my Five on Friday post over at Wardrobe Wednesday! Enjoy!